We started at 5:45pm with two canners: Janet of Facility Kitchens, and Briana, a first time canner doing strawberry salsa for her wedding. The Canning Diva, Diane Devereaux, ran the session. Janet planned to do asparagus and will wait because Heidi’s’ farm market of Lowell said the asparagus were not at their peak and waiting even a week will provide more plentiful and tender asparagus. Janet did a repeat of beans in pints and chocolate syrup in half-pints to improve her processes and recipes. The pork and beans were changed to vegetarian beans in tomato sauce using Northern beans. This was the second try for the beans and Janet’s conclusion is: Nuña or Northern beans are best, use 4 pounds of beans, mix 2.5 times the sauce ingredients called for in the recipe, be sure the beans are fairly soft before filling, fill jars with beans and onions to barely ¾ full to make the finished beans more saucy, and try for consistency in the amount of beans, onions and sauce per jar. Goal: 18 consistent pints in a session. See details and the recipe of Brianna’ Strawberry Salsa at www.canningdiva.com . Diane Deveraux developed and has perfected this recipe. The canned result is beautiful. A superb marmalade is a bonus from the reserve of the canning. This was Briana’s first production canning session and she hopes to have a full pantry by fall. June 13 and June 20 Diane’s Signature Strawberry Salsa is planned to be the featured production run both Thursday’s. No canning on the 23rd, Diane is off for the weekend. Thanks Diane for running the show, it makes a huge difference to have an experienced canner in the house. We're really looking forward to Thursday Canning Session with Diane the Canning Diva and Janet with Facility Kitchens! Come join us! Production Canning with the Canning Diva! What to Expect: Canners will be given time and resources to crank out a plethora of their vegetable of choice for their personal consumption! Whether its in-season Asparagus, Green and/or Wax Beans, of even off-season Brussels Sprouts, canners are welcome to spend their evening pickling until their heart’s content! Canners will need to bring their own ingredients and jars/rings/lids – however, Facility Kitchens will provide food prep and processing supplies, facility space and utilities and, not to mention, the Canning Diva will be onsite to share her knowledge while keeping production moving forward! 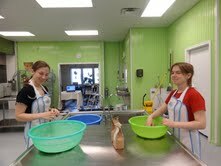 Diane and Janet did not can at the May 9, Thursday night production canning session. Newsflash: the asparagus are not here yet. Next week will be asparagus. We taste tested the chocolate syrup we produced last week. It is perfect. We considered adding cherry syrup into the chocolate syrup for chocolate/cherry syrup. We talked about how to improve the consistency and flavor of the pork and beans produced at last weeks’ session. They are good and the sauce should be thicker and a little spicier and maybe add molasses to the recipe. We considered leaving out the bacon to make vegetarian beans. We analyzed our production flow. Adding separators during the pressure canning of the beans will double the output. The next time beans are scheduled for production canning we aim to double the output. We planned some upcoming Thursday night canning sessions. 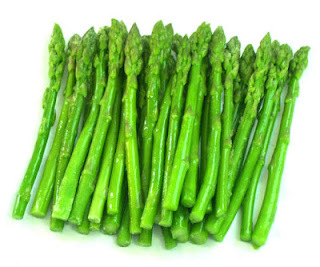 Next week asparagus season will be open. Rhubarb & strawberries are soon to follow. The production sessions we planned include pickling, canning, and pie filling. Canning started at 5:45pm finished by 9:45pm. There were two canners working with a little help from Janet’s daughter Madeleine and her friend Bridget. Janet of Facility Kitchens produced chocolate syrup and pork and beans. Diane Devereaux of the Canning Diva produced Dill Baby Carrots and Pickled garlic cloves. The beans and pork: The beans for two batches were started first using different beans in each batch. The beans were pre-cooked according to the recipe before the session to save time. Batch #1 used Meijer Naturals organic navy beans. Batch #2 used Shady Side Farm organic heirloom Nuña beans. Shady Side Farm suggested Nuña beans because under high temperature the beans soften and still hold their shape. (Their other tip was, sometimes beans do not soften if the tomato sauce is added before cooking. This recipe cooks the beans before adding the tomato sauce.) For the sauce, the amounts of ingredients were doubled over the recipe to make sure to have enough sauce. The chocolate sauce: When the canner was clicking smoothly, the chocolate syrup was started with a doubled recipe to make two batches in separate pots. The jars were filled and water bathed for 15 minutes. Dill Baby Carrots: Check The Canning Diva’s Facebook for information on the carrots. Pickled Garlic Cloves: Check The Canning Diva’s Facebook for details on the garlic cloves. Preparing the cloves was the hard part and Madeleine & Bridget were big helps. 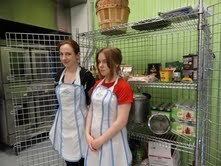 Pictured below are Bridgette and Madeleine before starting and cleaning the beans. Personal Canning Third Year Running in Facility Kitchens of Lowell! New this summer! The Canning Diva is running personal canning sessions every Thursday evening from 5:45pm to 10:15pm at Facility Kitchens in Lowell. You bring your ingredients, jars & lids to can as much as you want, or can, in 4.5 hours using Facility Kitchens’ large and efficient commercial rental kitchen. The cost is $45.00 for the 4.5-hour session. Their personal canning sessions will follow the harvest. They will start with asparagus; do rhubarb & strawberry pie filling, strawberry salsa, berry conserves, tomatoes in different ways, pickles, corn and specialty canning recipes. In the height of strawberry season, rhubarb & strawberry pie filling is planned for production on June 13, and the diva’s own recipe for “Signature Strawberry Salsa” is the June 20 featured production run. Go to www.canningdiva.com for her recipes and a list of ingredients, and how much you need to bring to scale up your production. Make online reservations at www.canningdiva.com. “I will lead a strawberry-filled adventure! In a 4.5-hour session, you can produce a plethora of “Signature Strawberry Salsa”, enough for your family to enjoy for the whole year”, said Diane Devereaux, The Canning Diva. Diane will keep the flow moving. She has extensive canning experience and she hopes this will increase production and reduce mistakes to improve each participant’s personal canning success. You do not need to be a veteran canner because she will there to answer questions as you work. For people who have big gardens, or CSA memberships, or want to buy bulk produce at farmer’s markets, they can get a lot canned in one evening. Facility Kitchens has large preparation sinks and tables, eleven burners with 300,000btus, and a machine jar sanitizer. Using a large, efficient, commercial rental kitchen can turn a big job into a 4.5-hour fun and productive evening. Check out www.canningdiva.com or www.facilitykitchens.com to get the up- to- date featured production for each week throughout the summer canning season. Workspaces are limited to six canners at a time and you may make your on-line reservations at www.canningdiva.com. This is the third year for Facility Kitchens to run personal canning sessions. When the thick of harvest starts in July and August and into September, Facility Kitchens hopes to add Monday evening personal canning sessions. For the Monday sessions, Leader of the Pack will be Laurie Brooks of Saranac and she will focus on basic canning recipes helping canners to put up summer’s harvest. Personal canning at Facility Kitchens is for both new and veteran canners. Shortly after each canning session, tallies, tips, notes and photos will be posted on Facility Kitchens’ blog. Keep checking in throughout the summer to see what was canned, and is planned to be canned, and see how they are doing on production. Stay tuned. 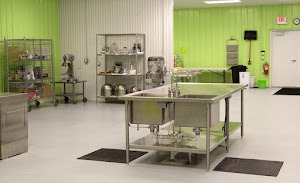 Facility Kitchens is a licensed, commercial, rental kitchen for food businesses to produce food products for sale. You may get directions and information about the facility, and see pictures on their website at www.facilitykitchens.com or email janet@facilitykitchens.com. Please join Diane the Canning Diva﻿ and Janet of Facility Kitchens﻿ this Thursday evening, May 2. We will be making chocolate syrup half-pints and pork and beans pints, and Diane Devereaux will can jelly samples for give-aways. The session starts at 5:45pm and runs until 10:15pm. Check out www.canningdiva.com to get a list of ingredients and make your reservations online.